The Tennant’s compact and agile 8210 sweeper scrubber combines powerful, big machine performance, with the ability to manoeuvre and clean in narrow aisles and confined spaces, making it ideal for congested facilities with difficult cleaning conditions. Equipped with a debris hopper that can be raised and emptied directly into a container, the 8210 sweeper scrubber controls environmental dust as it sweeps up dirt, powder, sand, broken glass, pallet chips and bulky litter. When scrubbing, it aggressively cleans and dries in one pass. Both processes feature one button operation and can be performed separately or simultaneously. Built to last, and easy to maintain, the Petrol, LPG or diesel driven 8210 sweeper scrubber employs intelligent electronics to provide diagnostic information and tell the operator when maintenance is needed. 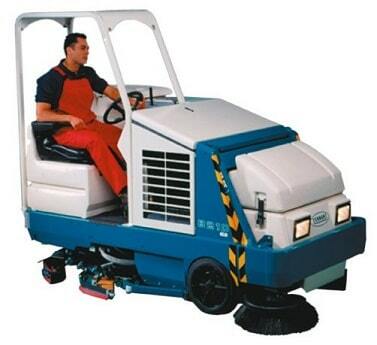 Sweeping is started at the touch of a single button, and like scrubbing, is continuously monitored and automatically adjusted to produce a vigorous cleaning action. The side brush moves debris away from walls, pallets and machinery into the path of the main brush, which in turn sweeps it directly into the hopper. One-button scrubbing and simple controls ensure maximum performance with the minimum of operator training. Two scrubbing widths are available; the MaxPro 1000 and the MaxPro 1200. Tennant’s Super Scrub system produces added scrubbing aggresiveness and the swing squeegee (True Track) gives superior water pickup during sharp turns, on both smooth and rough or cracked surfaces. The solution recycling system, (ES Plus Extended Scrubbing) delivers up to 3.5 hours continuous operation without the need to replenish the cleaning solution. Built to last, and easy to maintain, no tools are needed to change the squeegee, brushes or filters, this allows quick and easy operational maintenance. Automated functions make the 8210 easy to handle. They include: one button sweeping and scrubbing, self adjusting brushes, regular dust filter shaking to ensure optimal performance, and an intelligent LCD panel delivers audio visual diagnostic information and service reminders in 12 languages. The ergnomic cockpit, power steering, adjustable steering wheel, comfortable suspension seat, and the protection of a sturdy overhead guard, promote operator productivity and safety. Dust control is provided by a strong vacuum ventilator working in conjunction with a patented filter (Perma-Filter) and fresh air bypass. As a result, 99.98% of the finest dust is captured. And when the cleaning is finished…. The large capacity hopper can raise and empty its contents into containers up to 145cm high, and large clean-out ports allow fast and easy solution disposal.